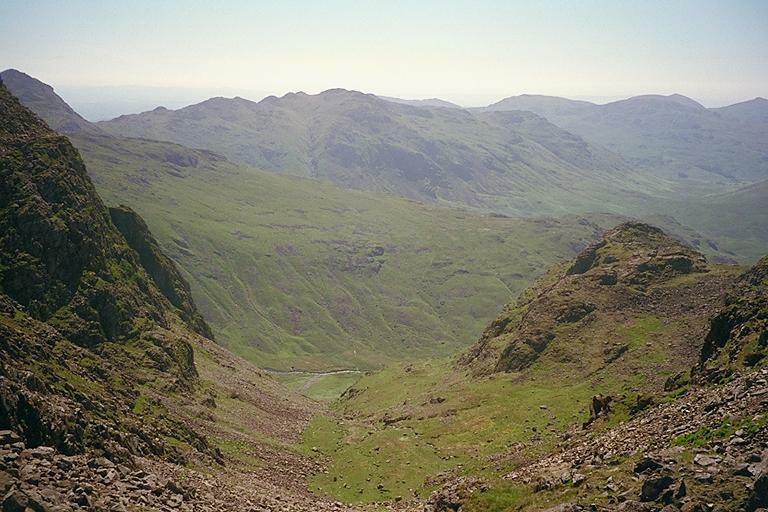 This is Upper Eskdale viewed from Broad Crag col, between Broad Crag and Scafell Pike, not from the Eskdale cairn, and not to be confused with Broad Stand, which is on Scafell. The small rocky eminence in the lower right is called Pen. On the horizon from the right is: Dow Crag, Coniston Old Man and Brim Fell (together), Swirl How and Great Carrs (together), Black Sails and part of Wetherlam being obscured by Crinkle Crags, the summit of Pike o'Blisco in the background, and Bowfell on the left. Stretched across the middle of the picture is the south ridge of Esk Pike. Smaller version of this picture.